The seven leveled falls are without doubt one of the most beautiful waterfalls in Thailand. 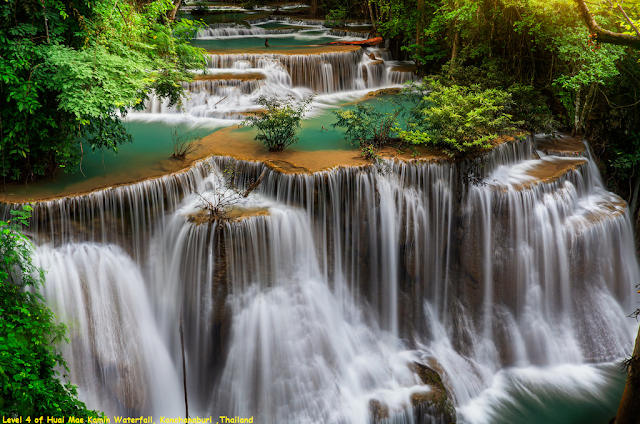 Unlike many other beauty spots in Kanchanaburi, Huay Mae Khamin falls have remained off the well-trodden tourist trails. The park is also known as Si Nakharin National Park. After a trip to Huay Mae Khamin falls, you will realize that it is still possible to find spectacular places in Thailand. The seven level falls are amongst the most stunning in Thailand and due to the off the trail location, can be enjoyed in relative peace and quiet, away from hordes of tourists. The waterfalls source is in the mountains to the east of the park, and eventually flow down to the River Kwai Yai. Other waterfall’s in the park include Pha Sawan and Pha Tat. Swimming is permitted all around the falls apart from the large drop on level four. The park also has many other attractions such as caves, hot springs, and the island studded Si Sawat Reservoir.